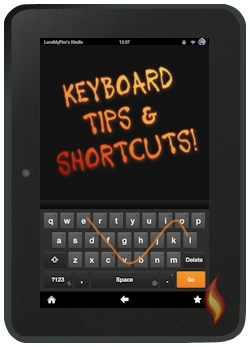 These simple Kindle Fire keyboard tips will really help to improve your tablet "typing" speed! Have you used the SWIPE feature? Even if you have, there are several swipe shortcuts you can use, so take a few minutes to learn these fantastic puppies! 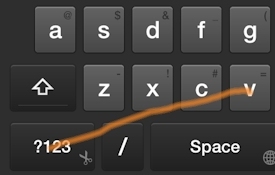 First read through my article about the Kindle Fire keyboard options and settings, if you haven't yet. That's where you'll learn about all the different keys and how to access them, including super cool ones like "cut", "copy", "paste", and more! Most of these tips only work on the newer Kindle Fires because the first generation tablets don't have the swipe software. If you're not sure which Kindle Fire you have I'll show you how you can know. 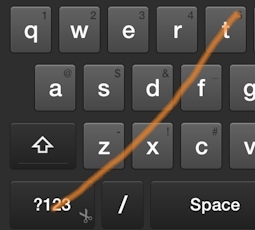 One of the best updates Amazon did was to add the swipe feature to the Kindle Fire keyboard! It's much faster to swipe what you want to "type" than to hunt and peck everything. Let's swipe together, shall we? Thanks to site visitor, Bob Frazier, for suggesting this awesome practice box idea! Okay, here's how you swipe. Gently tap the first letter of a word and continue sliding to the next letter and so forth until you reach the last letter where you stop and lift up your finger. There's also a bar that appears above the keyboard with the "current word prediction" of "love", "LOVE", "loved", etc. (as explained in my options and settings article). Are you ready for some awesome swipe tips? You're going to love these! Here's another practice text box for those reading this page on their tablet right now. 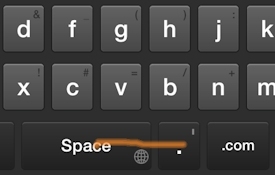 Just tap the "ABC" key to go back to the regular keyboard. Perfect at the end of sentences. You can start a URL with the traditional "www." with this swipe shortcut. 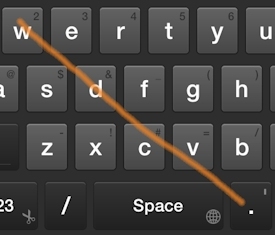 That's right, you can automatically capitalize a word without hitting the shift/arrow key. This is one of my favorite Kindle Fire keyboard tips. Start with the first letter and then swipe straight up and off the keyboard, then continue to the next letter in the word without lifting your finger from the screen. Let's type "love" again, this time making the "l" in caps with this tip. Now tap the ".com" key and you've got my website's URL! My site doesn't need capitals, but this was fun to practice, wasn't it? 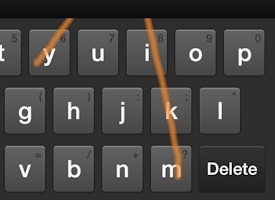 Okay, here's another Kindle Fire keyboard tip that should come in handy. Let's type a new word (just delete the previous one if it's still there). You can close the keyboard with this handy little tip. It should be plenty to keep you busy for awhile. If not, how about checking out all my other fabulous tips and tricks? How About an External Keyboard? If you're looking for speed, how about using a Kindle Fire bluetooth keyboard? If you found this article helpful please let me know in the comments below or share it with a friend (share links are at the bottom of this page under the comments). Thanks!